Las Vegas has a visual appeal like no other city in the world. 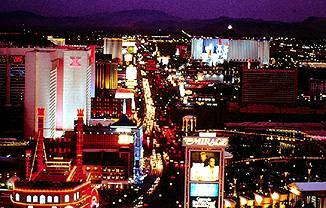 Hundreds of miles of neon and incandescent lights illuminate the Strip and downtown. Those two areas serve as a focal point for the millions of lights scattered across the desert floor of the broad, flat valley that nearly 1.5 million people call home. Because the land scape is so flat and relatively treeless, one need not climb very high to have a breathtaking view at night. Here are some great sports to view spectacular lighting. Ballon Las Vegas It is expensive but spectacular. The sunrise and sunset flights in hot-air ballons provide an incredible view of the city, as well as the mountains surroungint the valley. The flight might take passengers over the red sandstone rock formations of Red Rock Canyon or over Lake Mead, then land in the city where, for the sunset tour, the city lights are just coming alive. Hotel pickup is available. Price start at $125 per person. Children under 10 fly free with their parents. Call 702-596-7582. Bellagio This may sound strange, but it is cheap as it is free. The top floor of parking garage at the Bellagio provides an up-close view of several of the major resorts. You can pretend you are in Paris, with the Eiffel Tower looming over you. Casino Royal Trilussa Italian Restaurant at Casino Royal has ringside seats for the volcano at the Mirage, which explodes nightly every hour. This little-known hideaway across the street from the Mirage may also be one of thw world's greatest spots for people-watching, and it features great food. Call 702-737-3500. Helicopter Tours For less than the price of a gourmet meal, several companies offer helicopter tours of the Strip for a never-to-be-forgotten experience. Some even provide passenger pickup at the hotels. Prices start at $35 per person. Discount Helicopter Tours: 702-471-7155; Las Vegas Tours and Travel: 702-739-8975; Las Vegas Helicopters: 702-736-0013. Jackie Gaughn's Plaza The Center Stage Restaurant in this downtown hotel and casino offers a perfect spot to watch the light show at the Fremont Street Experience. Acanopy of 2 million lights performs computer-controlled light and music show nightly. Combine that with the lights of the hotels and the parade of humanity, and you will forget about dinner. The restaurant features steaks, ribs and Italian specialties. Call 702-386-2512. Paris Las Vegas The Eiffel Tower Restaurant is located at the top of the faux Eiffel Tower, some 51 stories above the Strip. The view includes the dazzling dancing fountains at the Bellagio across the street. Glasss elevator rides to an observation deck are available for $8. Call 702-948-6937. Regent Las Vegas This resort is located about 10 miles west of the Stip, in Summerlin. A terrace on the second-floor Upstairs Market Buffet offers a magnificent view. From this distance, the lights of the city and of the tourist areas are spread out at your feet. Call 702-869-7777. The Rio Terrace outisde the Voodoo Lounge on the 50th floor offer a view of the entire Strip. The view is so spectacular that USA Today called it one of the best places in the world to smoke a cigar. Call 702-252-7777. Stratosphere With an observation deck at about 900 feet, the views of the city and the Strip are hard to beat. Day or night, it is breathtaking. Dinner at the revolving Top of the World restaurant provides a view of the entire valley from your table. Elevator rides to the observation deck above the restaurant are $6 for adults, $4 for children ages 4 -12 and seniors 55 and older. Children under 3 ride free. Call 702-380-7711. Trumpets Restaurant at Anthem Center Located about 10 miles southeast of the Strip in the neighboring town of Henderson, this fine dining restaurant offers a nice panorama of the valley. Call 702-614-5858.